Package includes rail travel from Anchorage to Denali, rail travel between Denali and Mt. McKinley Princess Wilderness Lodge, overnights in both locations and rail travel from Talkeetna back to Anchorage. Transfers and baggage handling from rail depots are included. Your rail adventure begins aboard a luxury railcar as it departs the Anchorage Rail Station, northbound to Denali National Park. Upon arrival at your Denali-area hotel, take advantage of our Tour Desk, where the helpful staff can plan all of your Denali area activities. Overnight at Denali. This morning, transfer to the rail depot where you will board the train for the trip south to Talkeetna. The evening is yours to explore, enjoy a soak in our outdoor hot tubs, simply relax in the great room or enjoy the view of Denali from the deck. Overnight at Mt. McKinley Princess Wilderness Lodge. The morning is yours to savor a cup of espresso in the main lodge or add one last adventure to your trip. This afternoon, board a luxury railcar at the Talkeetna Rail station for a memorable trip south to Anchorage. Your tour ends upon arrival in Anchorage. 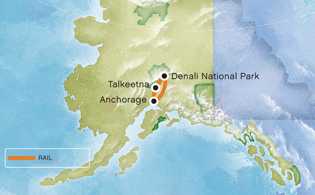 Package includes rail travel from Anchorage to Denali, rail travel between Denali and Mt. McKinley Princess Wilderness Lodge, 2 overnights Denali (park entrance area) and 1 night McKinley (Talkeetna area), Music of Denali Dinner Theater at McKinley Chalet Resort and rail travel from Talkeetna back to Anchorage. Transfers and baggage handling from rail depots are included. Be sure to check for specials offers. This four-night tour roundtrip from Anchorage is perfect for those who want to explore two unique sides of Denali National Park and maximize their time in both locations. Enjoy dinner and a show at the Music of Denali Dinner Theater at McKinley Chalet Resort featuring family-style dining and a spirited original musical about the first men to reach the summit of Denali. Package includes rail travel from Anchorage to Denali, rail travel between Denali and Mt. McKinley Princess Wilderness Lodge, 2 overnights Denali hotel (park entrance area) and 2 nights Mt. McKinley Princess Lodge (Talkeetna area), Music of Denali Dinner Theater at McKinley Chalet Resort and rail travel from Talkeetna back to Anchorage. Transfers and baggage handling from rail depots are included. Be sure to check for specials offers. Enjoy the day exploring Denali's south side in Denali State Park and Talkeetna. This five-day/four-night tour roundtrip from Anchorage is perfect for those who want to explore two unique sides of Denali National Park. Beginning and ending with an overnight in Anchorage and overnights at two different lodges in the Denali area, you are sure to maximize your Alaska experience. Package includes an overnight at the beginning and end of the tour in Anchorage, rail travel from Anchorage to Denali, rail or motorcoach travel between Denali and Mt. McKinley Princess Wilderness Lodge, overnights in both locations and rail travel from Talkeetna back to Anchorage. All transfers between airport, hotels and rail depots are included. Be sure to check for specials and offers. Transfer from your hotel to the rail depot. Your rail adventure begins aboard luxury railcar as it departs the Anchorage Rail Station, northbound to Denali National Park. Upon arrival to Denali, transfer to your Denali-area hotel. Take advantage of the long hours of daylight for an optional tour and discover all this area has to offer. Overnight Denali-area hotel. Enjoy a leisurely morning before transfering to the rail depot for your train trip southbound to Talkeetna and the Mt. McKinley Princess Wilderness Lodge. The evening is yours to explore, enjoy a soak in our outdoor hot tubs, simply relax in the great room or enjoy the view of Denali from the deck. Overnight at Mt. McKinley Princess Wilderness Lodge. This morning explore the region with an outdoor adventure that matches your every whim. Go kayaking on Byers Lake or try your hand at sport fishing. An array of tour options are available to purchase at the tour desk. Transfer to the rail depot this afternoon to board a luxury railcar for a memorable rail trip south. Upon arrival into Anchorage, transfer to your hotel. Overnight at Anchorage hotel.